Traditional Ukrainian carrot salad with mayo. Small side dish, for those who are not afraid of garlic – healthy, tasty and easy to make. Why not to try it next time with your toast or Sunday lunch? OR: Use a natural yogurt or vegan mayo. 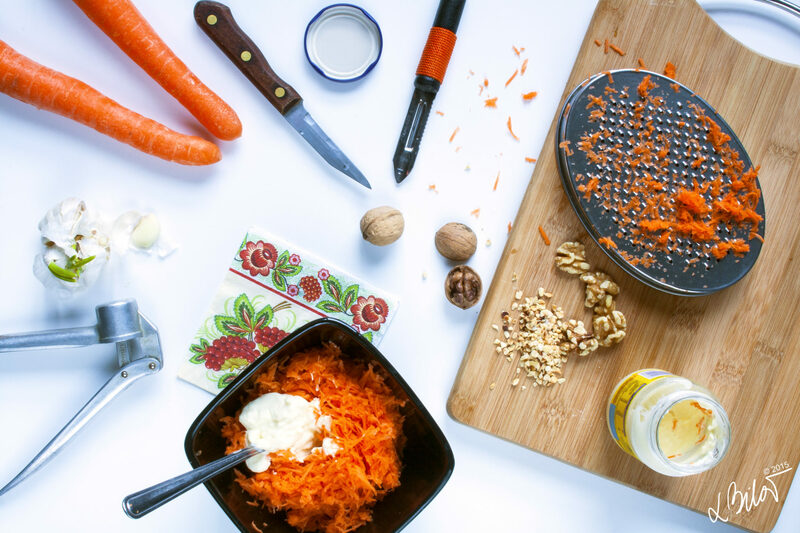 Peel the carrots, grate them into bowl, press in one medium-sized garlic clove, add chopped/crushed walnuts, mix it all up with Mayo. And voilà your salad is ready. Easy as that! Cold, as a garnish with meal, or as a side with your sandwich. Decorate with parsley leafs. after you grate the carrots there can be too much juice in it, which will make the salad runny/watery – Drain & drink it’s a healthy shot! Carrot is good for your eyes! Is it? Carrot salad with a lots of mayo, as a garnish with some crispy roast chicken & boiled potatoes.